Are you planning for your special wedding day and considering how to handle pizza catering? There are so many options, some more formal and some more traditional – did you know that pizza can be silver-cutlery-and-waited-tables-posh, or it can be a brilliant al fresco centrepiece or an evening snack perfect for your reception’s party atmosphere? Pizza is very versatile and we wanted to showcase just a handful of the amazing ways we’ve performed pizza catering for a variety of weddings over the years. If you have more guests arriving in the evening for a reception or a party, then pizza makes a brilliant evening snack. Wood-fired pizza is an ideal option for the evening, it’s informal, our ovens add a theatrical and social centrepiece and you can serve lots of guests fast! Our pizzas are cooked fast and we’ll continue to keep the buffet tables stacked with hot pizzas just out of the oven. Festival style weddings have deservedly become one of the most popular themed wedding styles. Following the popularity and culture of music and art festivals they usually take place outdoors, using large marquees or teepees. 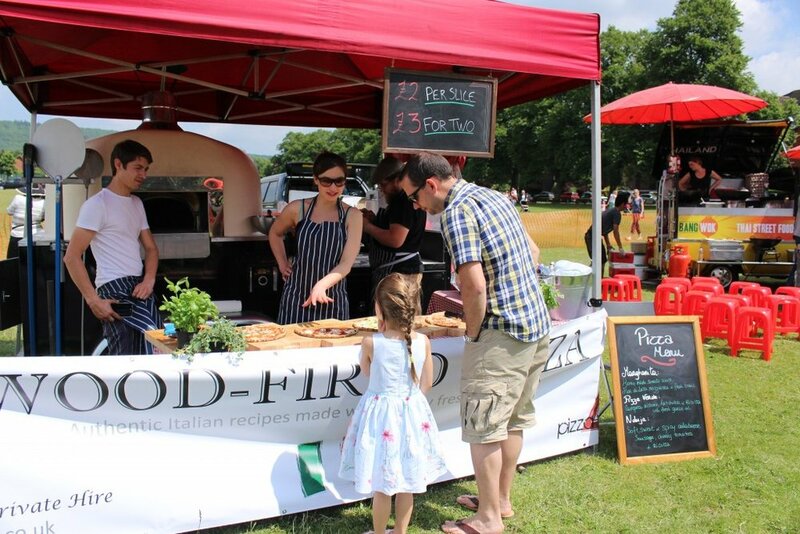 Wood-fired pizza is a classic and very popular at music and art festivals and many festival weddings also opt for pizza! Our stone wood-fired pizza ovens fit right into the theme, and we often decorate them with flowers, props and more to match the festival theme! Buffet catering frees your guests from the table and allows them to mingle and walk up and choose their own food. Our wood-fired pizzas are a brilliant option for a buffet table because guests can choose from a variety of pizzas and salads. We can also prepare antipasti and canapes to be served for buffet guests. Taking the festival style wedding one level further, why not invite a few food stalls? In addition to the wood-fired pizza you could have Thai food, fish & chips and an artisan burger van?! A food festival caters for lots of different tastes and makes an amazing social hub for your guests. You’ll want to ensure each vendor can prepare and serve smaller portions (like pizza by the slice). Food tokens can also be handed out to guests to ensure they all get a taste of everything! Pizza Project has been catering for weddings for over 5 years. Our stone wood-fired pizza ovens have been used in a huge variety of ways, and importantly, always leave our clients and their guests satisfied. If you would like to learn more about what we offer, visit our wedding catering page now.